Three movements for alto trombone and piano, op. 236Aa / Eric Gross. Score: Concerto for alto trombone and concert band, op. 236 / Eric Gross. Parts: Concerto for alto trombone and concert band, op. 236 / Eric Gross. 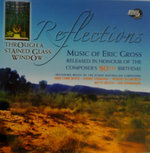 CD: Reflections through a stained glass window / music of Eric Gross. Score [ePDF]: Concerto for alto trombone and concert band, op. 236 : [eScore] / Eric Gross.